Mixing live Drums and Bass are very different from Mixing Programmed Drums and Bass and Mixing Hip Hop/EDM and R&B can present a whole new set of issues! ‘Kick’ or ‘Bass’ Drums can be pure tones like 808’s or any kind of thump! They can be completely percussive or a note that is tuned! There are no rules! Hip Hop and Dance Music have pushed the boundaries of traditional beat making, often using samples slowed down and chopped up of the some most random sounds! This creative mentality has spilled over into Pop and the Hit Pop Song ‘The Middle’ by Zedd, Maren Morris and Grey for instance uses an axe chopping wood as a snare! 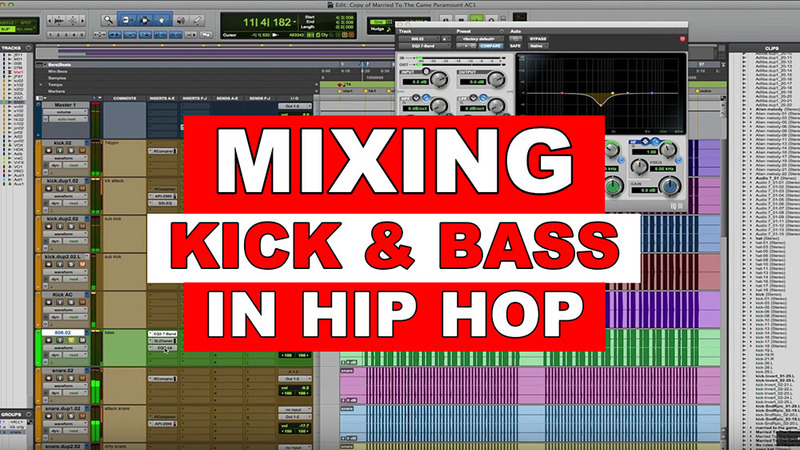 Mr. Ariel Chobaz (Nicki Minaj, Drake, Rihanna, Eminem, NAS) and our good friend, Grammy Winner, Bob Horn show us how they mix kick and bass in Hip Hop! These ideas can be applied in many other songs/genres with dense low end! The two excerpts are from their Mixing HipHop Courses. If you want to learn EVEN MORE about mixing Hip Hop, we’re offering these 2 courses for the price of ONE!